First coat of spar varnish! The last two days I've been racing to finish putting the cedar “skin” on our grill cabinet (one step at right), and last night I did the last bit. 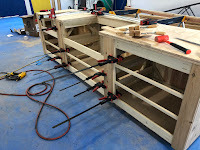 My brother Scott helped me lift the three sections onto saw horses in my paint tent late in the afternoon – and then I was ready to start the painting operation. The spray I bought for this sort of work is a Graco HVLP 9.5, pictured at left. The “HVLP” stands for “High Volume, Low Pressure” – a technology that uses a large volume of air at low pressure to distribute the paint. This particular kind of rig was recommended to me by a professional painter for cabinet work, and after using it for the first time today I can tell you that I got very good advice. 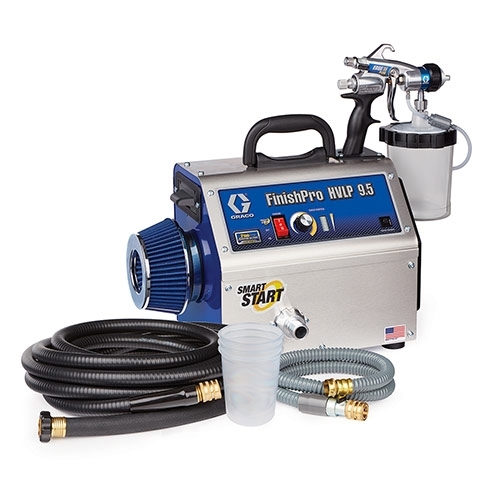 It is very easy to control the paint with this unit, particularly compared with the conventional high pressure spray rigs I've used in the past, or with the more modern airless painters. Highly recommended! Since I'd never used one of these before, there was a definite learning curve. The spray gun has more adjustments on it than you might think, and I had to fiddle a bit to get the thick spar varnish to work right. I thought there was a good chance I'd have to thin the varnish down to make it sprayable, but it worked fine right out of the can once I got the gun tweaked right. This particular model of sprayer has a gun that works in any position, even upside down. That made spraying the inside and the bottom quite straightforward – I'm so glad I didn't have to brush all this! It took me about two hours, including the initial learning curve, to spray the first coat on all three sections. I did the outsides and the insides all in a single go; there will be just four small spots on the bottom of each section that are left unpainted; I'll touch those up with a brush. 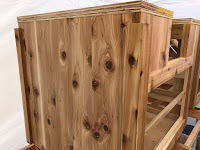 The photo at right shows one cedar side after the first coat – I'm quite pleased with how that came out.